and a new, major-label album on track for September. in his two decade-plus career. A Michael Franti & Spearhead show is a spiritual experience. Fans know it. First-timers discover it. There's just something about Franti as a frontman that inspires people. Tall, dreadlocked, dynamic and - just ask the ladies - dreamy, the singer has charisma for miles. He also has momentum as never before in his two decade-plus career beginning with industrial hard-core hoppers the Beatnigs, then on to the brilliant Disposable Heroes of Hipoprisy to Spearhead. Franti's first Top 20 Billboard Hot 100 single "Say Hey (I Love You)" from All Rebel Rockers was certified platinum. His new album, The Sound Of Sunshine, is out Sept. 21. 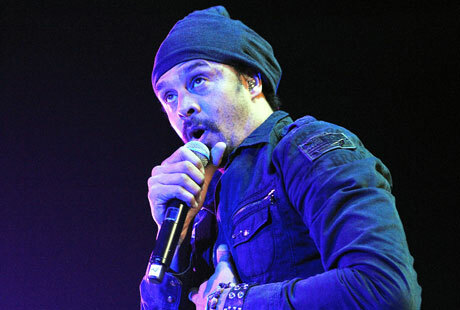 The title track and dance-hall groover "Shake It" are bringing mega spins to the Bay Area crew's michaelfranti.com site. He's back on a major label for the first time, inking a deal with EMI Capitol. Having stated he'd never go back on one after a bad experience with Spearhead's second album, is this the man going back on his word? "We did the last two albums with Anti, the two before that with different indie labels," says Franti. "And when All Rebel Rockers started to get a lot of radio play at American Top 40 radio stations, Anti couldn't handle the demands and suggested a deal with Universal. "So we signed for one record with Universal, and were looking at doing one with them again, but they didn't want to let us run our website our way, which was a stumbling block, because that is essential to our thing." EMI Capitol didn't have any problems with the band doing its regular FrantiTV broadcasts or using its site for all of its many activist activities. They just wanted a band whose single had tested higher than Beyonce's with radio markets. It's a funny thing for Franti that, on the same week that he hit the Top 20, his appendix burst and he had to go into emergency surgery. "It was a real wake-up call, and I missed three weeks of touring. But the experience of being alive with friends, my kids, people in the hospital, really put me in this positive spin. "I'd go out and play my guitar and just soak in the sun shining outside, and that's what inspired the new album's title and the song. So much gratitude to be breathing it all in." No surprises here. This is a fellow who toured war zones across the globe with little more than a hand-held camera and an acoustic guitar to make a documentary titled I Know I'm Not Alone that played major festivals worldwide with an accompanying soundtrack album Yell Fire! While it isn't easy being patently positive, he believes in it. "I wanted this record to be able to give people something positive in a time of difficult global change. Right now, we have tough times economically, this major oil spill, global warming and climate change altering our very existence and I knew coming out of surgery that I needed to make an album about staying positive in bad times."